CABARET AT THE MERC brings the very best of Broadway to beautiful Old Town Temecula, on the last Sunday of each month! Our audiences have asked us for years to do a night of Jason Robert Brown. Though long overdue, the wait is finally over! 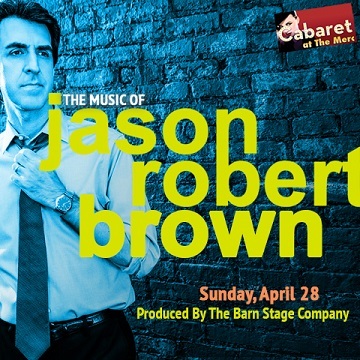 From his earlier theatrical works of Songs for a New World and The Last 5 Years to his recent musical adaptations of The Bridges of Madison County, Honeymoon in Vegas, and the Tony Award winning PARADE, JRB has proven himself to be one of Broadway's most respected and revered composer/lyricists of our generation. His distinct sound of pop-rock stylings fused with theatrical lyrics make him a truly unique songwriter. We hope you will join us on Sunday Night, April 28th for an unforgettable night of contemporary musical theatre!